Scientists have developed a self-destructing battery capable of dissolving when exposed to heat or liquid. It delivers 2.5 volts and can power a desktop calculator for 15 minutes. It could be used to keep military secrets confidential, and in environmental monitoring devices . Iowa State University mechanical engineering professor Reza Montazami said it was the first practical transient battery. Prof Montazami developed the lithium-ion battery with a team of scientists who recently published details of their discovery in the Journal of Polymer Science, Part B: Polymer Physics. It measures 5mm in length, is 1mm thick and 6mm wide, and is similar to commercial batteries in terms of its components, structure and electrochemical reactions. It contains an anode, cathode and an electrolyte separator within two layers of polyvinyl alcohol-based polymer. When dropped in water, the battery's polymer casing swells and the electrodes are broken apart, causing it to dissolve. However, it contains nanoparticles which do not degrade, meaning it does not dissolve entirely. "Unlike conventional electronics that are designed to last for extensive periods of time, a key and unique attribute of transient electronics is to operate over a typically short and well-defined period, and undergo fast and, ideally, complete self-deconstruction and vanish when transiency is triggered," the scientific paper stated. While it would be possible to create a more powerful battery, it would take longer to break down. 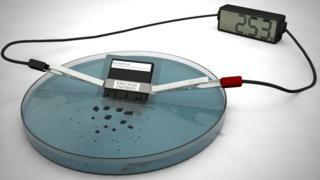 Dissolvable batteries could play a part in helping to reduce the waste caused by discarded electronics. Researchers at the University of Illinois at Urbana-Champaign are working on electronic circuit boards capable of dissolving in water. Once in a landfill site, the boards could break down within three to six months, according to the University's prof John Rogers. Can technology help tackle the world's waste crisis?